love, fresh air and sunshine: Welcome back, traditional wheat! It all started in early 2012 when I looked up online to make a change in my diet to heal my eczema. I had liquid-oozing and itching patches all over my body! I found wheat to be right on the top of the list of foods to be given up. And I did so. Within a period of one month, 50% of my patches healed and disappeared. More importantly, a supposedly neurological condition I was suffering from for a whole lifetime called Restless Leg Syndrome (RLS) that wouldn't allow me to sleep at night, simply disappeared. For the first time in my life, I was sleeping through the night! I can't tell you enough what a great relief it was. I lost 13 kilos in a matter of 6 months. All that weight had been from my body being inflammated. I started feeling healthier and more energetic. Every time I have wheat, I get my RLS back. My healing from eczema is another long story I'll tell very soon. Just fifteen minutes after I forwarded medical journal articles about how avoiding wheat could help my FIL find some pain relief from rheumatoid arthritis, I heard back from him asking me for a list of foods that contained wheat. That very day, he went cold-turkey on wheat and dairy. In just three weeks time, he started losing weight from bloating and had to alter all his pant waistlines. He started reducing his pain medication and eventually stopped it altogether. Occasionally, when he does consume wheat, his pain comes back for a day or two and then disappears again. Being a general physician, a wheat-free diet has become part of his standard prescription to patients who come complaining of joint pains. He says that every one of them comes back with a positive experience from giving up wheat. Another friend who had serious issues with her digestion, got healed from giving up wheat. Another friend who suffered from chronic clinical depression felt much more cheerful after she gave up wheat. My sister started to heal in many ways after she went wheat-free. My mom who had been suffering from leg pain for over two years now just eliminated wheat from her diet and says she had the first pain-free month in years. She has stayed away from chappati since then. My six-year old daughter suffers from RLS in exactly the same way as I do. And she's also prone to eczema. She had cradle cap until last year, when I consciously reduced the amount of her wheat intake. And there are more stories from my own circle of friends and family. What is it in wheat? The gluten, the sticky substance that gives the dough its elasticity, is the culprit. Wheat has been cultivated and consumed without problems for thousands of years across the world, including in India. It is the modern hybrid varieties bred by Normal Borlaug and his team in the 1950s as part of the Green Revolution that started this problem. The protein structure of modern hybrid wheat is supposed to be very difficult to digest. When the gut is leaky (i.e. our digestion is not at its optimum) the undigested protein leaks into the bloodstream, which then treats it as a toxin, unleashing a wide range of diseases depending on our body type. More of us than we think / know, could be allergic to hybrid wheat! Until recently, it was thought that only some people, who had this severe condition called 'Celiac disease' were to avoid wheat. But no! Wheat allergy is an impending epidemic in India and all over the world, also according to a leading gastro-entrologist from CMC published a research article in IJMR (Indian Journal of Medical Research). The reaction to wheat shows up differently in different people. It ranges from bloating, migraine, arthritis, asthma, eczema, anemia all the way up to auto-immune disorders like rheumatoid arthritis and multiple sclerosis. Gluten-free diet has been found to be hugely helpful for autistic children. And so on. The best way is to simply test it for oneself. That's what The Quad team from Chennai recommend to all their clients: 'Give up all productscontaining wheat for 40 days and see for yourself how your bodyresponds'. It is said that two other grains, rye and barley, also contain gluten. But in this part of the country, we don't use them as much as we do wheat. Wheat is not just in chappatis and other baked products. It is also hidden in asofetida (hing / perungayam), soy-sauce, as maida in some soup recipes. And yes, even extremely small quantities matter. And also know / remember that maida is refined wheat and has more gluten than does whole wheat per unit weight. The friend, who I earlier mentioned, suffered from chronic depression originally could not even tolerate extremely small amounts of wheat. She underwent a long course of Ayurvedic treatment from a well-known vaidya in Chennai, Dr. PLT Girija, to heal her gut. One day she called me and said “Guess what? After years, I can eat whole samosas again, and nothing happens to me!” I'm waiting to see how long-term this cure is. Another case study from the same doctor's website explains in great detail how a child was cured of gluten and other food allergies. But, according to another school of thought, wheat is just not the food of the future. According to them, spiritually speaking, the human DNA structure is changing with evolution of consciousness, and wheat is on its way out as a source of energy for the humans, especially for those who want to contain and channel higher frequencies of energy. Traditionally, bread making was supposed to be a really long process. The dough sat fermenting for days together before being baked. This also digested the wheat protein making it even easier for the body to process and absorb. 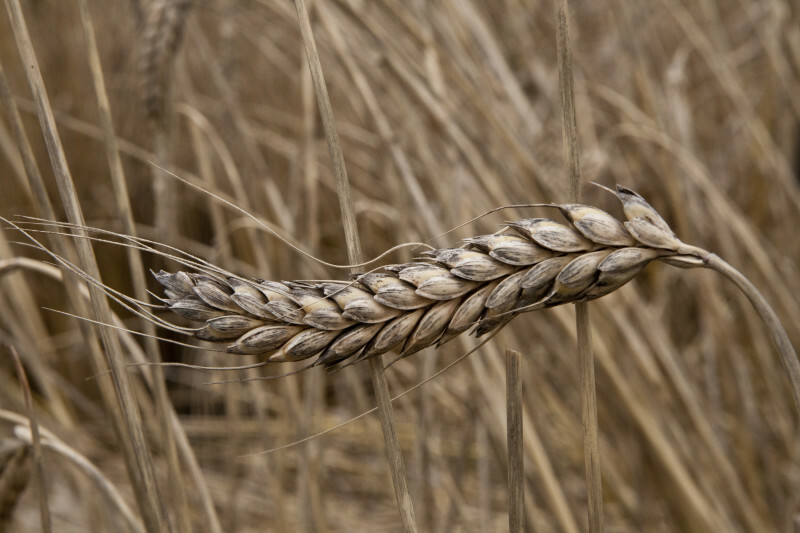 Wheat fermentation also produced phytase, a phytic-acid inhibitor, that aided nutrient absorption better. These days, it's allowed to sit for a matter of a few hours only. So, whether traditional or modern wheat, ferment your dough. Let it sit overnight and rise slowly. This makes wheat more digestible and more healthful. Across the country, the revival of traditional paddy varieties has really caught on like wild fire. With more and more farmers wanting them for their fields, the seeds of what were once called 'low-yielding and unscientific' varieties are now in great demand. Seed festivals across the country are on the rise, with thousands of people – urban and rural farmers – thronging to them. Wheat is now following suit. This time, it's triggered mainly by the range of diseases that the hybrid wheat consumption has unleashed. Khatiya wheat, Emmer wheat, Einkorn wheat, Spelt wheat are the known names of varieties that were grown in India and other parts of the world for thousands of years. They can all give good yields in poor soils, use much less water to grow and are resistant to disease and pest. Vandana Shiva documents some varieties in this article on Biopiracy of Wheat. It has been three years since I gave up hybrid wheat and have sorely missed pasta, pizza, parathas, samosas and other baked stuff. But now I can enjoy traditional wheat without any side effect! The market for these wild / ancient / traditional wheat varieties is booming in the west, where gluten allergy is quite rampant and well researched, acknowledged and documented. In South India, I know of a few places where you can get them. * Emmer Wheat: Auroville Bakery makes Emmer Bread. These breads are also available in a few stores in Thiruvannamalai, where I buy from. * Spelt Wheat: Tantos Pizzeria in Auroville sells Spelt Pizza, Spelt Pasta, Spelt Lasagna. * Khatiya Wheat: reStore sells Khatiya wheat dahliya (rava) and flour to make chappatis. Disclaimer: If you are a Celiac Patient, please consult your doctor before making any dietary changes. If you're suffering from gluten-sensitivity, please try this by all means. Request: I am not qualified in medical science. If there are scientific / factual errors in this article, please bring them to my notice. Thanks! I was told by Shami Nanda in his talk given in restore sometime back, that wheat is not a Indian native grain and it came in to being from the days of being a British colony. Naturopath Sithar from Thanjavur says our body has cell memory and it can not recognise such foreign grains and other food, hence it should not be consumed by us. In this context should we really need wheat, when we have our own traditional hand pounded rice? My father also has lots of skin issues, and he being a diabetic had moved from rice to wheat. Is organic wheat available in stores a substitute? How do we know if it's not a hybrid or not? I am based out of hyd. I have recently ordered the organic wheat (bansi variety) avaliable at daana.in . Not sure if it also has similar characteristics. I am not sure that wheat is entirely foreign to us. I have not read anywhere that it is. Since traditional varieties is almost not available to us right now, 'wheat' has become all 'hybrid wheat'. We need to research and explore this further! Harsha, I don't know whether Bansi, though the name sounds Indian, is a traditional wheat variety. Will let you know if and when I find out. Bansi is a traditional wheat variety. I was reading a book by Subhash Palekar on Zero Budget Spiritual Farming where Bansi is mentioned. The name struck me because I had read this comment earlier. Happy to understand that Bansi traditional and ancient Indian wheat is available in Indore. I wish to implement ZBNF model and was on the look out for Bansi Wheat sowing seeds. Looking forward to hearing from you (I am on email with id ..
We have given up wheat but do have to eat it intermittently. A few days ago our local organic farmer gave us Bansi wheat and it is simply amazing! The flour doesn't stick to your mouth and it is so light in the stomach! My husband's itch has all but vanished. Thanks to all you wonderful people out there who are rescuing us from the ills of GM and hybrid foods!